Suspended 360° Support Product No. 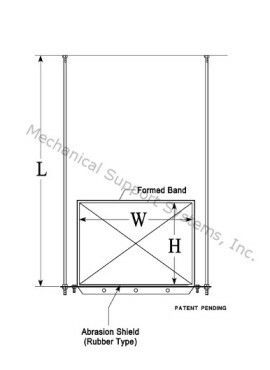 100-S | Mechanical Support Systems, Inc.
Full 360° support has both an upper and lower 180° half-saddle manufactured to O.D. of pipe with welded stem for added strength. 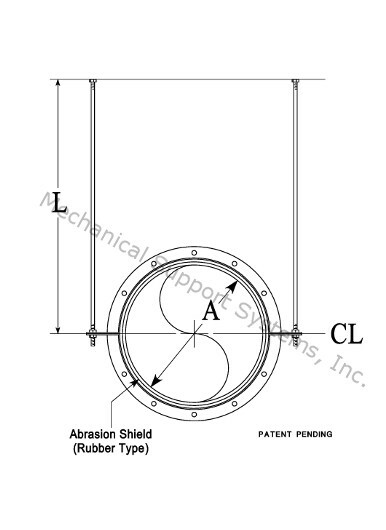 Support width is determined by diameter of saddle. Saddle widths manufactured in 4”, 6” or 8”. Saddle material thickness varies from .1345” to .5” depending on loads. Saddles connected with Grade 5 zinc plated nuts and bolts. Easily adjusted up or down. 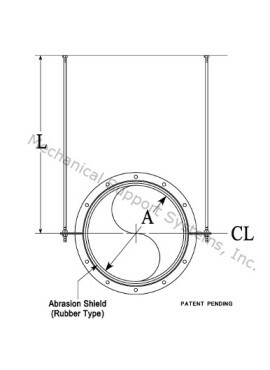 Upper and lower support is lined with .0625” rubber type abrasion shield. Suspended using ½”-16 threaded rod cut to length.